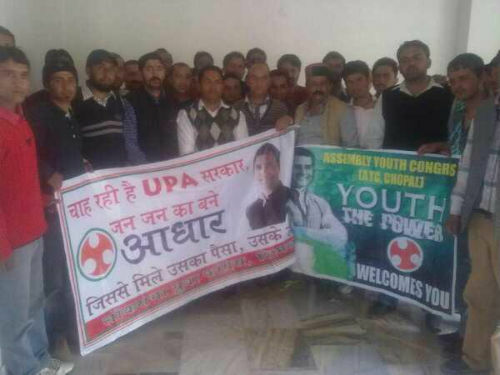 On the second day of Aadhar card campaign, Shimla Lok Sabha Youth Congress (LYC) visited Nerwa (Chopal Assembly Constituency), Rohnat and Shilai of Sirmour district. Youth congress team propagates the usages of Aadhar card. However, at Nerwa meeting, Congress workers shown their anger toward Govt and former legislature as they blamed for sidelined by them. They alleged that Chopal segment is not getting their rightful dues from the government. Agitated Congress supporters asked Mohender Thakur and Manish Thakur and other youth congress leaders to take their matter with the party high command and apprised them with the situation of Chopal segment. They warned that if party high-command didn’t intervene Congress can lose their stronghold in this region. At Shilai, former legislature Harshvardhan Singh welcomed youth leaders and lauded their afford for educating villagers with the advantages of Aadhar card. He also lauded the role of Youth congress for helping party to strengthen its base on the grassroot level. 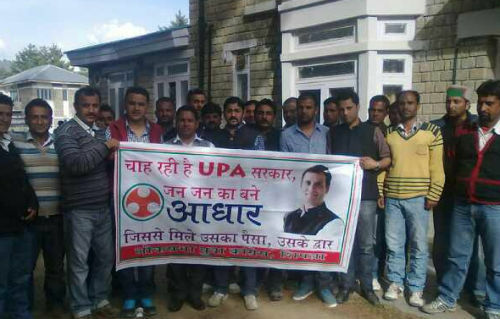 Himachal Pradesh Youth Congress Gen Sec Mohender Thakur, Shimla LYC President Manish Thakur, Vikas Kalta, Vinay Hetta, Shilai youth Congress leader Tota Ram and other youth congress leader were present in this campaign.